To display a screenshot in your browser, click on its preview image below. This mode is based on Mefy's popular MOHAA Freeze Tag mode. It's a team play elimination mode in which players can resurrect their eliminated team mates. 4. Pulsating rings now appear beneath active REs. 5. Players will no longer have to wait behind bots in their side's resurrection queue. 6. MI6 and Janus survivor counts are now displayed on eliminated players' screens. 7. MI6 and Janus survivor counts are now displayed on spectators' screens. 8. A permanent HUD message now tells eliminated players what their resurrection queue position is. 3. The chat message announcements for eliminations and resurrections now mention the names of the players who have been eliminated and resurrected. 4. These chat message announcements are now printed for bot eliminations and resurrections. 1. Bugs from the previously released beta versions have been fixed. I'll test it out for you. 1. You don't need to show the popupmessage when a player spawns every time. 2. Use the coordinates Euphonic used in Uplink for the MI6 and Janus players remaining at the top of the screen. Yours is too close to the top and it's off centered. I'll download it and give it a test. HUD Messages will hopefully be getting some tweaks in a future release to fix kerning problems (KM and I were talking about this just this morning), but for now the coordinates in Uplink probably are the best positions as Troy said. I forgot to include the configuration file in the beta 1.00 zip when I uploaded it at 3 am this morning my time, I've now added it to the zip. This configuration file has one command which will prevent enemies from appearing on players' radars. IMO this mode is a lot more enjoyable when players have to hunt down and kill their losing enemies before their enemies can resurrect enough team mates to fight back. Thanks Troy and Euphonic for helping me test this, I will make the improvements suggested by Troy. This pleases me to see a brand new custom gamemode released to the public. Thanks for all of your hard work Joe! * The "Die Another Day" pop up message will now only be shown to players when they spawn for the first time. * The MI6 and Janus survivor counts are now more horizontally centred than they were in the previous version. * There is now some space between the survivor counts and the top of the screen. I didn't use any coordinates from Euphonic's script. I want to make GE:S display two value progress bars on the same line, so I can't use the -1 x coordinate to make GE:S horizontally centre them both perfectly. Thanks, I hope you will enjoy playing this mode. I suggest changing the resurrection timer from digits to a progress bar ("Resurrecting [|||||| ]"), it'll be less wordy and translate better. Make the top message (Janus 1/3 MI6 0/3 or w/e) thing display all the time (except when waiting for players)---it's nice to have something that immediately shows what gameplay you're playing. Have you considered using objective icons? It plays pretty well, and I'm interested in seeing how it would play in a packed server. 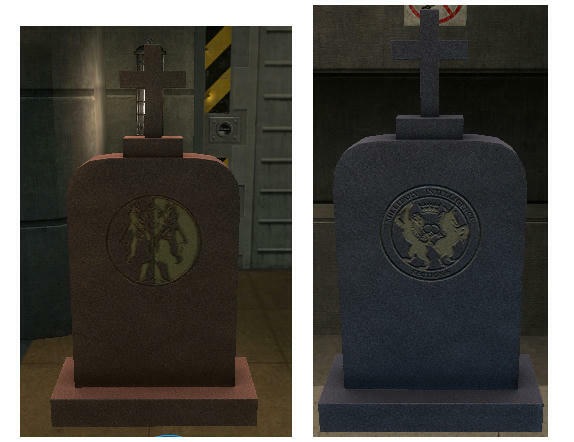 A custom model for the resurrection spots would also help, imo. I suggest changing the resurrection timer from digits to a progress bar ("Resurrecting [|||||| ]"), it'll be less wordy and translate better. I would personally prefer to see "Resurrecting:" followed by a seconds countdown. I will create a poll. Make the top message (Janus 1/3 MI6 0/3 or w/e) thing display all the time (except when waiting for players)---it's nice to have something that immediately shows what gameplay you're playing. Have you considered using objective icons? Are you referring to a token radar icon? I think the token radar icon would look better than the capture point icon. A custom model for the resurrection spots would also help, imo. What do you think the custom model should be? One person has said that they would prefer to see gravestones. I can only make very simple models and I can't make textures, so if there is going to be custom models I won't be able to make them. I think the RE model which is used should be big enough to be easily targeted with the long range resurrection ability and its appearance should change when it's being used. I will release a new beta version tomorrow. Gravestone for sure. Here you are. I hope it'll work, just noticed i compiled it as prop_physics, rather should have been just static & dynamic. But it was allready uploaded and i g2g to work, so no time to do it again right now. i will do another compile later. Maybe just do a cross for the radar icon.